[prMac.com] Swindon, United Kingdom - Many people plan projects by placing sticky notes on a wall. This is very intuitive and can work well for quick brain storming sessions, but it isn't an effective way to manage ongoing projects. The alternative is to use project management software. Unfortunately project management software tends to be expensive, hard to learn and lacking in flexibility. Oryx Digital founder Andy Brice thought that there was a gap in the market. "We wanted a visual planning tool with the flexibility of sticking colored notes to a wall, but without the physical limitations. We couldn't find one that we liked, so we created Hyper Plan." said Andy Brice, founder of software product company Oryx Digital Ltd.
Hyper Plan allows you to create 'cards' with properties such as: 'status', 'priority', 'assigned to' and 'budget'. The cards can then be arranged and colored according to these properties. For example, you could arrange cards into columns 'to do', 'doing', 'done' and 'waiting' with rows for each member of staff, and colored according to priority. Or you could arrange them in rows by priority, colored by who they have been assigned to. You can switch between views with a mouse click. Hyper Plan can also arrange cards in a timeline and total numerical properties by row and column (similar to a pivot table in a spreadsheet, but easier). Hyper Plan is highly suitable for new approaches to planning, such as 'Kanban' planning, pioneered by Toyota, and 'agile' planning, which is becoming increasingly popular in software development. "I run a busy team of pre-sales engineers working on many different opportunities in parallel. Hyper Plan provides me with an effective way to visualise the activities of my team and help me make priority calls. I have found it very easy to use and its massive configurability means I can tailor it to suit my needs and company processes." 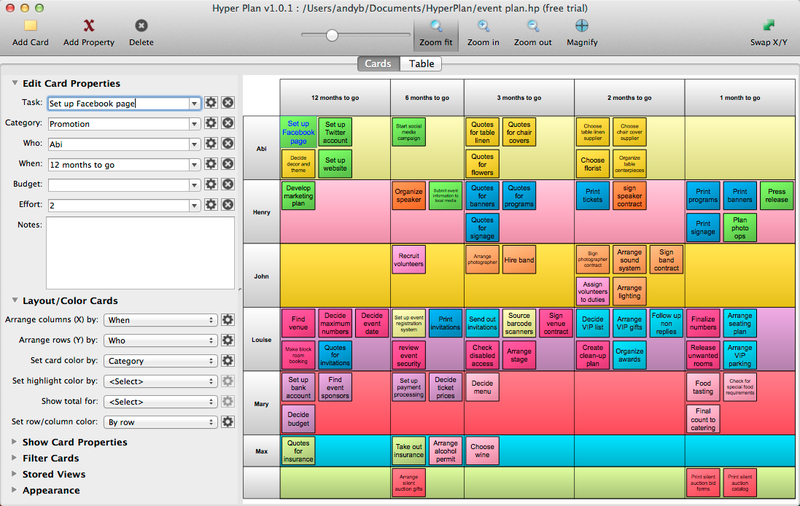 Hyper Plan is available for Mac OS X and Windows, priced at just $40/�25/�33 per user at http://www.hyperplan.com. It comes with a 60 day money-back guarantee. You can download a free trial from the website. Oryx Digital Ltd is software company based in Wiltshire, England. Copyright (C) 2015 Oryx Digital Ltd. All Rights Reserved. Apple, the Apple logo, Mac OS X, and Macintosh are registered trademarks of Apple Inc. in the U.S. and/or other countries.